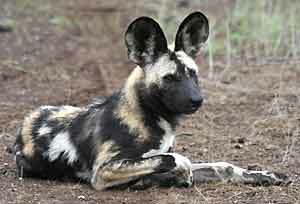 African Wild Dogs or Painted Dogs (Lycaon pictus) have a remarkable social system totally based on co-operation. On average, packs consist of about 10 adults although they may be smaller or much bigger. Within each pack there are separate rank structures for male and female animals; normally only the alpha male and female will breed, producing a litter of six to 16 pups (the most of any canid) and the whole pack helps feed the suckling mother and the pups (after 3-4 weeks) by regurgitating food. When occasionally a subordinate female has pups, they do not usually survive, although it has happened. This may be because unless it is a very large pack it will be difficult to feed more than one litter. The pups remain in the den for 8-10 weeks. When the pack returns from hunting the adults run up with twittering cries and flip the pups over and lick them while the pups beg for food which is regurgitated for them. When they are old enough the pups will straggle after the hunt; the adults having killed will immediately gorge themselves but as soon as the pups arrive they beg for food and the adults make way for them on the kill. Decrepit or injured dogs that can't keep up will also beg and receive food, either direct from the kill or regurgitated for them. This begging behaviour is the basis of social interaction between wild dogs throughout their lives. Like most predators they spend most of their time resting; when one of them (not necessarily the alpha male or female) decides it is time to go hunting they all get up and perform a greeting ceremony consisting of mutually submissive behaviour based on the begging rituals. Like that equally endangered species, the English gentleman, they seem to go through life saying "After you" - "No, after you." There is so seldom any overt aggression among wild dogs that often the only way to identify the alpha pair is to watch them urine-mark: when the alpha female urinates the alpha male will immediately do the same on top of it. It is well-known that unlike most social animals (eg lions), among wild dogs it is the females who leave their natal pack to seek breeding opportunities, but it may be more complicated than that. Recent research indicates that the pack may split if either alpha dog dies, the males remaining in their home range and the females emigrating to find males unrelated to them. If the alpha male dies, the surviving alpha female retains her rank in the female group, usually for life. If either the alpha male or female dies however the dominant male from, surprisingly, the youngest adult group in the pack will take over as alpha male. His predecessor, if still alive, remains in the pack as a subordinate. This "pack dissolution" system would be very effective in preventing in-breeding, but it depends on there being other packs in adjoining home ranges which the emigrating females can link with and from which new females can come, and in many areas nowadays that is a big problem. The same researcher believes that male dogs will not accept older unrelated dogs as alphas, which has major implications for re-introduction programmes. Wild dogs are now critically endangered and extinct over much of their original range. They have suffered more than most species because of ignorance and misconceptions; unbelievably, up to as recently as the 1970s there was a deliberate campaign to exterminate them even in many game reserves. Nowadays human encroachment is a major threat as wild dogs cover huge areas, which makes them particularly vulnerable to snaring. There have also been some major population crashes in areas such as the Serengeti in recent years, probably because of diseases such as rabies and distemper although the cause of the outbreak is the subject of a quietly vicious dispute among academics; phrases like "fatally flawed data" which is the academic equivalent of a kick in the groin are being bandied about. Nevertheless all is not lost. There are still wild places where wild dogs are holding their own, and there is good work being done on breeding and reintroduction programmes. If these are to succeed however it will have to be in accordance with the complex social systems of these remarkable and fascinating animals; simply plumping groups together will not work. See also See also Wild Dog Information and Wild Dogs - Efficient Hunters that Kill to Eat. Roddy Smith is a wildlife conservationist and safari guide based at Mwambashi River Lodge in the Lower Zambezi National Park, Zambia.